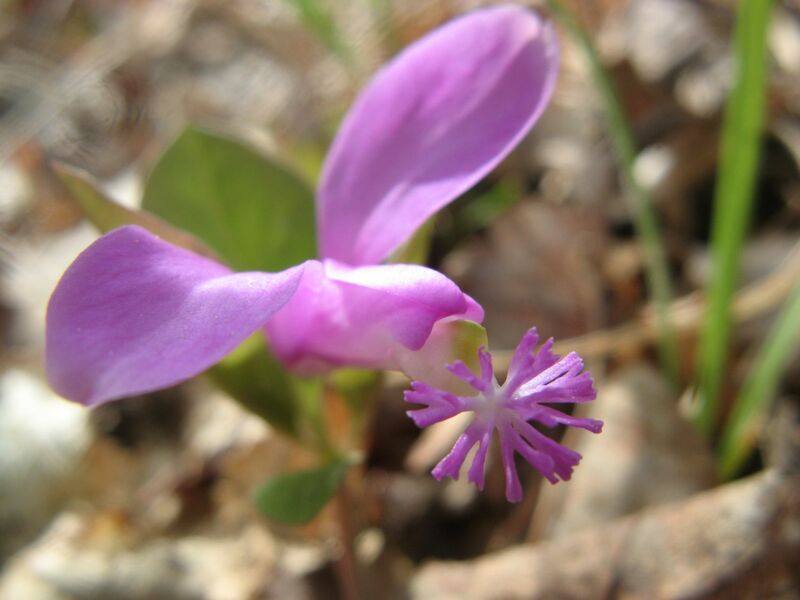 There is a sweet little flower (Polygala paucifolia) that blooms in our woods about the same time as the trilliums. It is called Fringed Polygala, which doesn’t do justice to the plant, but also Gaywings, which captures the essence of the flowers better. You could almost call them funny; they look like little hot pink airplane propellers. By my own decree, I am supposed to either take a walk or ride the exercise bicycle 5 days a week. By my own confession, I haven’t been meeting this objective for quite a while. It was a beautiful day; I examined my excuses for not going on this walk, and found them wanting. The possibility of finding white gaywings was a definite draw. So was the fact that my dear husband agreed to go with me. The white form of gaywings is even more difficult to photograph than the more common pink form. 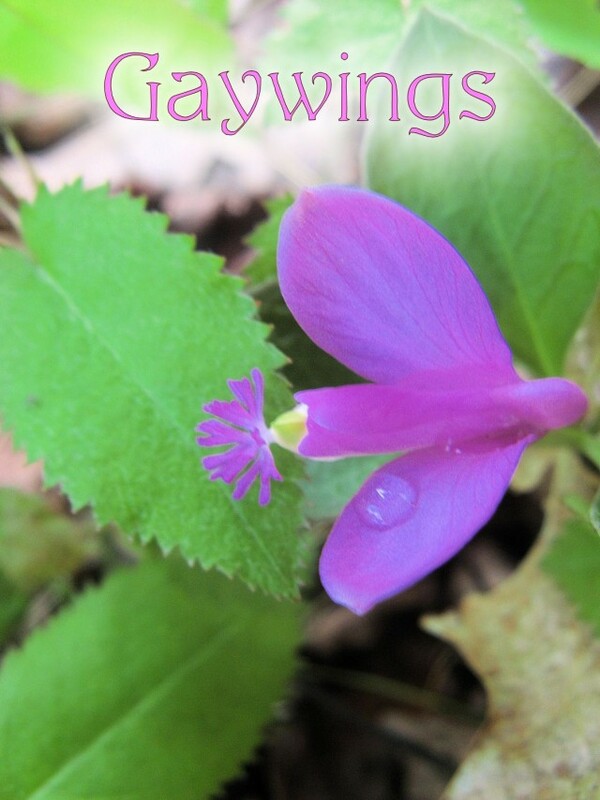 We found the white gaywings where Talitha said we would, and we found some in another spot quite removed from the first clump. We also found another plant in bloom that I have yet to identify. The flowers are yellow and resemble those of the common wood sorrel (Oxalis stricta), but the leaves don’t look anything like it. (I didn’t bring a specimen down with me, so I’m describing from memory.) They were three-lobed–almost like 3 hepatica leaves fused together in shape, although larger than that in size. The leaves were held above the flowers. 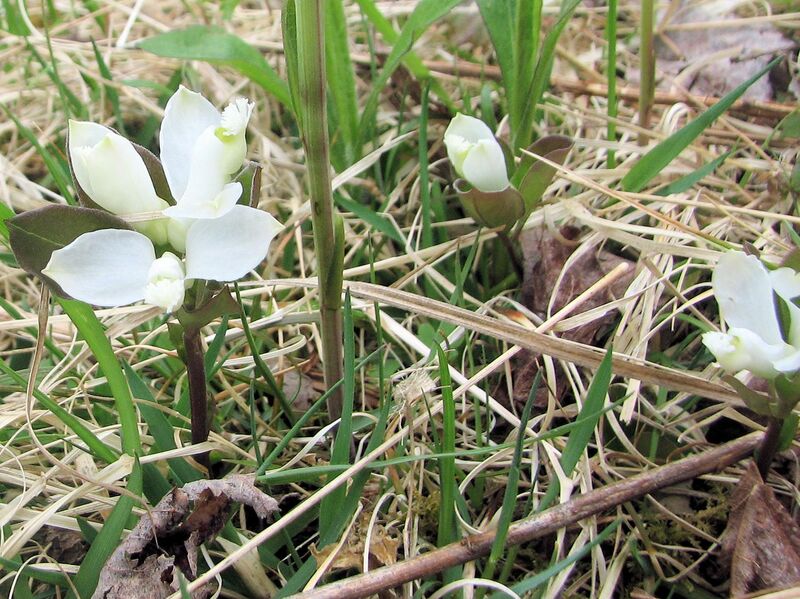 I couldn’t find this in my National Audubon Society Field Guide to North American Wildflowers–Eastern Region , admittedly not the most recent edition, so I am hoping to find it in Wildflowers of New York in Color when I check it out of the library this Wednesday. This latter book is worth investigating if you live anywhere in the Northeast. The photos are, for the most part, better than in the Audubon guide, and because it’s more focused, you don’t spend as much time flipping pages of plants from other climates east of the Rockies. The one flaw I find in it, is that it doesn’t distinguish between native and non-native plants in its descriptions. Everything that survived last summer’s drought seemed to find the snowy winter and mild, wet spring to its liking, and was thriving. I can’t remember ever seeing so many gaywings before. Either they have spread quite a bit in the last ten years, or I have just become more alert to their presence. Hundreds of Seedlings. . .